Chocolate? I love chocolate. Honey mustard? Ditto. And burgers? Boy, I love burgers. I adore all of these—just not at the same time, thank you. 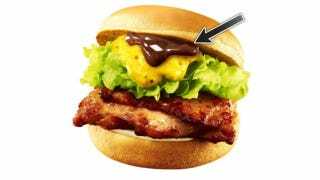 That's exactly what's happening next month with burger chain Lotteria is releasing the "Chocolate and Honey Mustard Grilled Chicken Burger." It goes on sale February 6 for 390 yen (US$3.77)—just in time to gross everyone out for Valentine's Day! As with Lotteria's chocolate sauce fries, the chicken burgers will be slathered in a chocolate sauce made with Ghana chocolate. The burger is only available until the end of the month. Eat it while you can.